COVINA – You can always go home. And that’s exactly where California head coach Jason Van Duyne went Thursday night in a quarterfinal game of the 59th annual Covina High School Christmas Tournament. Van Duyne, who played basketball at Covina, watched his team defeat Los Altos, 69-53, in a game featuring two different halves. After holding a 27-26 lead after two quarters the Condors pulled away, particularly at the free-throw line, and cruised to their ninth victory of the season against four losses. Los Altos fell to 7-4. California was a perfect 9 for 9 in the third quarter and 7 of 9 in the fourth quarter on free throws. The Condors will play Damien, a 77-74 overtime winner over Northview, tonight at 7 p.m. in the championship semifinals. In the other semifinal game, Rowland, a 66-29 winner over Bishop Amat, will play the winner of the Covina/La Salle game tonight at 8:30. “I went to Covina High School in the mid 90s and played varsity basketball with (Covina coach) Willie Bissman,” Van Duyne said. MONTEBELLO – El Rancho High School’s last-minute comeback fell just short in a 57-55 loss to Rialto in Thursday’s quarterfinals of the Cardinal Classic girls basketball tournament hosted by Cantwell Sacred Heart of Mary. The Dons (12-2), trailing 57-50, scored five consecutive points. El Rancho had one last possession with 12.5 seconds remaining in regulation, but Rialto’s Brittany Neely secured the Knights’ victory by grabbing a defensive rebound off El Rancho’s game-tying attempt. The 1-2 punch of Patty Ayala and Khadidja Diakite paced the Dons. Ayala scored a game-high 25 points while Diakite had 22. El Rancho will play a consolation game today against Cantwell at 5:30 p.m. Cantwell fell to Bishop Montgomery in another quarterfinal. Thursday’s meeting marked El Rancho’s second game against Rialto this season. At last week’s Las Vegas Tournament, the Dons defeated Rialto 57-47 in the semifinals. El Rancho went on to capture first place in that tournament with a 53-48 triumph over Castlemont. “We played them in Vegas.” El Rancho coach Randy Shigezane said. “We were familiar with them and they were familiar with us. It was one of those things; it’s hard to beat a team twice in a week. We did our best. We played pretty well. We just came up two points short. Miya Arrington led Rialto with 19 points. Neely had 18. Several local high school teams will take part in tournament action this week. The Cantwell Sacred Heart girls basketball team is hosting its annual Cardinal Classic, which started Saturday. The 32-team field includes Cantwell, El Rancho, Santa Fe and Whittier. Games will be played at Cantwell and St. Matthias in Downey. 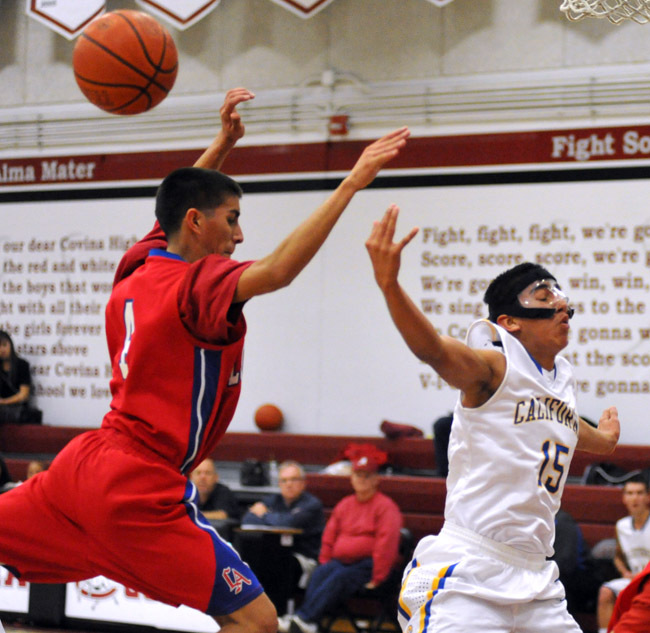 Whittier, Santa Fe and Cantwell all started tournament play on Saturday with victories in the bracket-style event. Santa Fe, which defeated Mayfair 41-40, will play the winner of Wednesday’s Mountain View-Bishop Montgomery game on Wednesday at 5:30 p.m. at Cantwell. Whittier, a winner over Azusa, will face either San Pedro or St. Mary’s on Wednesday at 8:30 p.m. at Cantwell. The host Cardinals, who opened with a win over Nogales, will take on either Price or El Segundo on Wednesday at 7 p.m. at Cantwell. El Rancho will begin its tournament run on Wednesday at 11:30 a.m. against Ramona Convent. That game will be played at St. Matthias. St. Paul High School named Rick Zepeda as its new football coach, according to school officials. Zepeda will take over a Swordsmen team that went 1-9 overall and 0-5 in the Mission League last season. The Swordsmen, who were ranked No. 1 in the Daily News preseason poll, had gone into 2012 with high expectations. But they struggled through a dismal year that resulted in the firing of head coach Elijah Asante during the season. Casey Morales, the school’s athletic director, took over the head coaching duties and finished the season. Zepeda, who graduated from St. Paul in 1988, previously served as head coach at El Rancho for four years (2008-11) before working as the defensive coordinator at St. John Bosco last season. 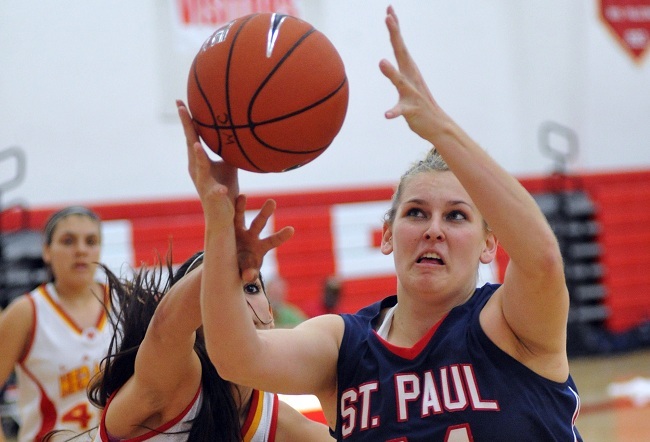 After advancing to last year’s CIF-Southern Section Division 4A girls basketball semifinals, St. Paul High School has high hopes for the 2012-13 season. The Swordsmen, who lost to Brentwood 49-41 in the semifinals the previous season, are ranked No. 2 in the Division 4A preseason poll. They have started strong, posting an 8-2 record before Thursday’s nonleague game against Serra. Senior power forward Holly Shafer, who averaged 14 points and eight rebounds per game last season, helps lead a Swordsmen team that also features senior guard Priscilla Hidalgo, senior forward Cassidy Carrillo and guards Shannon Cruz-Canul, Clarissa Hernandez and Clarissa Perez. After posting an 0-8 record in the tough Del Rey League last year, the Swordsmen (17-15 overall in 2011-12) have switched to the Camino Real League. They start league play against Cantwell Sacred Heart on Jan. 8. The Camino Real schedule also figures to be a challenge for the Swordsmen. The league also features St. Monica and Cantwell-Sacred Heart, which are ranked No. 1 and No. 7 respectively in the Division 4A preseason poll.